Dr. Karen Yan is a warm and considerate pediatrician practicing at ProHEALTH's Lake Success Pediatrics in New Hyde Park, NY. Dr. Yan is certified by the American Board of Pediatrics. She has a special interest in multiple food allergies and is familiar with the challenges faced by affected families. Dr. Yan earned her medical degree from the State University of New York, Downstate Medical Center in 1998. She went on to complete her residency at Long Island Jewish Medical Center. As a proud mom of two children, she is also dedicated to making breast pumping a reality for every working mother. Dr. Yan is sensitive to the uniqueness of each patient's situation and adapts her consultations and treatment options appropriately to accommodate individual needs and concerns. She is skilled in examining and treating children in ways that help them relax and cooperate. 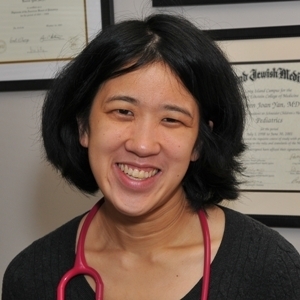 Dr. Karen Yan, MD has no appointments on Zocdoc right now.